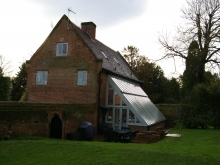 Extensions and alterations to an Arts and Craft listed Farmhouse dating from 1904. The brief required substantial extensions to a grade II listed farmhouse, to provide ancillary accommodation and enhance the existing entrance. Designed and built in the early 20th century the original farmhouse was a published example of Arts and Craft architecture. Referencing the work of Voysey the completed scheme extended the original house to form a new entrance courtyard. The two new wings completed the typical arrangement of main house, ancillary/servant wing and stabling/coachhouse wing which was common in the early 1900s. 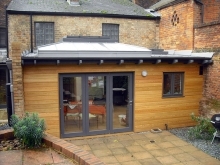 The extension provides additional living space within a green oak and glass gabled element together with two additional bedrooms and a semi basement providing a cinema room. 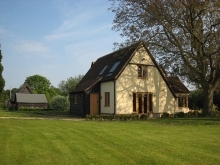 The northern wing placed opposite the main house provides a large games room and garaging. Traditional materials and methods of construction were used throughout. Work continued within the original farmhouse to improve circulation and re-model rooms, with an emphasis on natural materials and highly detailed finish.